Theater in the Now: Review: Here's to Latrice! When you can silence a cabaret crowd, you know you're a winner. And Latrice Royale is a winner. Bringing hope and inspiration, Here's to Life is not what you're expecting but it's everything you needed. Playing the Laurie Beechman Theatre, Latrice Royale's Here's to Life is a solo cabaret that glistens from start to finish. For those expecting a typical drag show, you are rudely mistaken. This is the epitome of a solo cabaret. Latrice, the stage name of Timothy Wilcots, shares personal stories, both in the realm of happy and personal, accompanying them with an appropriate songbook including fan favorite showtunes. For those unfamiliar with her time on RuPaul's Drag Race Season 4 and All Stars, Latrice takes a moment to share a few takes on the show and shady references to former queens, but this show goes beyond and digs down deep. She shares her journey to get into those size sixteen heels. As a performer, Latrice is captivating. She brings a Barry White-like soulful voice. The rasp in her voice defines the wisdom of her words. When she offers inspiration, it's authentic. Here’s to Life is a message of hope and inspired that is filled with heart. Directed by Braden Chapman, better known as Mimi Imfurst, guides Latrice on her extraordinary journey. There’s an ease on stage that is warm and inviting. Chapman helps bring the emotion out of Latrice that entices the audience to listen to every word. All while avoiding their meal. With Christopher Hamblin on the keys, there was an immense amount of trust in the room. Latrice and Hamblin worked well off of one another, allowing Latrice to riff when needed. Here’s to Life is a celebration of the things we take for granted. 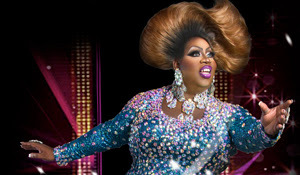 Latrice Royale is a performer like no other. Latrice is who she is and no one is going to take that away from her.